As the sea plane banks to the right and I look down through the open window, sunlight glints off one of the largest solar arrays I’ve ever seen, and the next thing I know we are splashing down in the turquoise waters of Fiji’s fabled Blue Lagoon. The pilot cuts the propeller and out from the shallows comes a grass-skirted welcome party that looks the same as that which must have greeted Captain Cook himself when he sailed through these equatorial waters more than two centuries earlier. 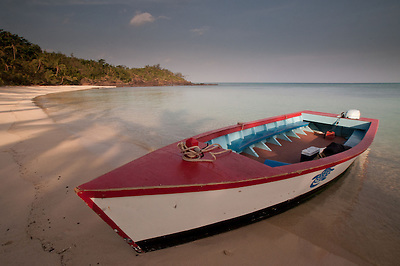 As I step off the plane’s pontoon into the clear water and dig my toes into the white sand below, zebra fish scatter in every direction, and I head for shore. After traveling for most of the previous 24 hours from my home in soggy Seattle, it certainly feels good to finally set foot on Fiji’s Turtle Island, one of the world’s most famous tropical resorts and the idyllic setting of the 1980 blockbuster Blue Lagoon that launched the career of a young beauty named Brooke Shields. While Turtle Island has been well-known for decades as a getaway for the rich and famous, only recently has it started to get the respect it deserves as a leading light in sustainable tourism. And that includes maintaining an age-old respect for Mother Nature and her ways. American entrepreneur Richard Evanson bought the uninhabited 500-acre island in 1972, giving up the trappings of life back in the U.S. for a tent, a two-way radio and all the fresh fish he could eat. With the help of some locals, he eventually built himself a “bure” (a traditional Fijian thatched-roof dwelling), kicked a nasty drinking habit and began his life’s work of creating a self-sustaining tropical paradise.Located some 50 miles offshore from the Fijian “mainland,” Turtle Island is the only one of 26 islands in the Yasawa archipelago that is privately held. The other Yasawas, undeveloped by modern standards, remain home to several native Fijian villages. But just because Turtle Island caters to guests from more “civilized” locales doesn’t make it any less Fijian. The staff of 80 locals that hail from neighboring islands ensures that the culture and spirit of the South Pacific pervades the resort. “I wanted to take the barren and make it beautiful,” says Evanson, now 78 and still living on and running Turtle Island. Indeed, he had his work cut out for him. The island was in rough shape when he took it over. Goats brought on by a previous owner had done a number on the landscape, grazing away a majority of the once lush native foliage. With landscape restoration a top priority, Evanson estimates that he and his staff have planted upwards of two million trees on the island over the four decades he has called it home. Coconut palms, casuarinas, papayas, monkey pods, Honduran mahoganies and a host of other equatorial trees now occupy every possible niche there. Besides looking lush and providing habitat for parrots, fruit bats and lots of other wildlife, Turtle Island’s trees also serve as the source for all the wood used to build and repair the buildings and furniture used by resort staff and guests every day. Of course, trees aren’t the only thing Evanson has planted on Turtle Island, where organic agriculture has been providing 90 percent of the food consumed there since the 1970s. These days three full-time gardeners oversee five acres worth of organic raised beds and greenhouses. Food waste and brushy debris is composted for fertilizer. Hydroponic cultivation techniques preserve the island’s limited freshwater and thin tropical soils. And plant spacing and other natural methods keep pests at bay without chemicals. While sustainability has always been a priority for Evanson, Turtle Island’s new solar array, which went online in early 2013, takes that commitment to a higher level. 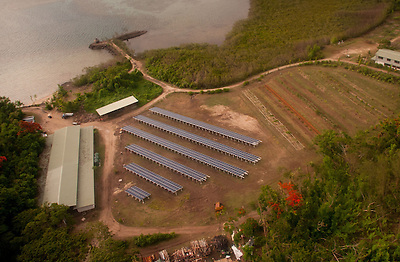 The 228 kilowatt photovoltaic system–the largest in the South Pacific–accounts for 85 percent of the island’s energy needs and is expected to save the resort some 220 tons of greenhouse gas emissions and 85,000 liters of diesel fuel per year. The $1.5 million price tag for installing and setting it up will pay for itself in saved fuel costs within six years. Of course, it’s hard to remember all the good green things going on at Turtle Island while lying in a palm-shaded beachfront hammock, flippering around a coral reef alongside multi-hued tropical fish or savoring a plein-air dinner featuring the catch of the day. But whether or not guests realize it, Evanson’s focus on sustainability is a large part of the reason that the resort in all its finery is still around today. Indeed, we can all learn a thing or two from Turtle Island no matter where we live.